Chuck Pagano had a largely successful run as the head coach of the Colts, but he’s not interested in taking that title again in his career, as ESPN.com’s Jeff Dickerson writes. The Bears’ new defensive coordinator says he’s excited for his fresh challenge and doesn’t anticipate wanting an HC job after the 2019 season. The Bears hired Pagano earlier this month to replace Vic Fangio after he left to become head coach of the Broncos. It’s unquestionably a great opportunity for Pagano as he’ll be handed the keys to one of the league’s most talented defenses. He’ll have a great deal of freedom and creative control too as head coach Matt Nagy puts the bulk of his focus on the offense. For what it’s worth, Pagano interviewed with the Broncos and Packers for their HC openings in this past cycle, so a change of heart may not be out of the question. After interviewing with team brass earlier on Friday, Chuck Pagano was hired as the Bears’ new defensive coordinator, the team announced [Twitter link]. The former Colts head coach and Ravens defensive coordinator returns to the sideline after a year-long hiatus in 2018. He will replace Vic Fangio, who left for Denver to take the Broncos’ head coaching position. Pagano finds himself in an ideal spot, as he inherits a defensive unit that ranked first in points allowed and in takeaways in 2018. In addition to the Bears, Pagano received interest from the Browns, Cardinals and Jets for their defensive coordinator vacancy. He was also interviewed for head coach with the Packers and Broncos. Pagano, 58, seemed like a wise choice for his experience running the same 3-4 defense that brought the Bears success a year ago, and his history with some of the league’s top defensive units, including the Ravens in 2011. 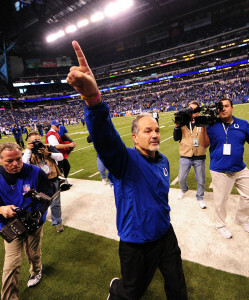 After serving as defensive coordinator in Baltimore for a year, Pagano assumed the head coaching role in Indianapolis. In six seasons on the job, he led the Colts to three 11-win seasons and another pair of 8-8 campaigns before going 4-12 without starting quarterback Andrew Luck in 2017. The Bears on Thursday interviewed defensive backs coach Ed Donatell for their vacant defensive coordinator position, according to Brad Biggs of the Chicago Tribune. 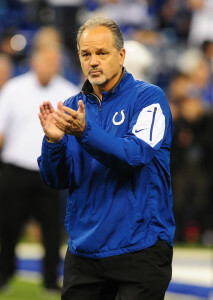 Chicago also has interest in former Colts head coach Chuck Pagano. After losing ex-DC Vic Fangio — who became the Broncos’ head coach — earlier this week, the Bears attempted to land former Jets head coach Todd Bowles as their new defensive play-caller, but he ultimately followed Bruce Arians to Tampa Bay. Fangio led a defensive unit which ranked first in nearly every defensive metric, and is so well-stocked with talent that, as Biggs notes, general manager Ryan Pace and head coach Matt Nagy shouldn’t have trouble generating interest in the open position. Donatell has been a Fangio disciple since 2011, following the longtime DC to both San Francisco and Chicago as a defensive backs coach. He’s also served as a defensive coordinator for the Packers (2000-03), Falcons (2004-06), and Redskins (2008). Per Biggs, Donatell’s contract with the Bears has run out, and if he’s not promoted to DC in Chicago, he’s likely to leave to join Fangio in Denver. Donatell has already had two stints as the Broncos’ defensive backs coach. Pagano, 58, didn’t coach last season after being fired by Indianapolis, but he’s generated plenty of interest during the 2019 hiring cycle. He interviewed for both the Packers and Broncos head coaching positions, and has since been mentioned as a DC candidate for the Jets, Browns, and Cardinals. Just today, Pagano interviewed for a defensive backs coach position with the Panthers. Both the Cardinals and Browns are interested in hiring former Colts head coach Chuck Pagano as defensive coordinator, according to Kent Somers of the Arizona Republic (Twitter link). Pagano may indeed be the favorite for the Arizona job, per Somers. 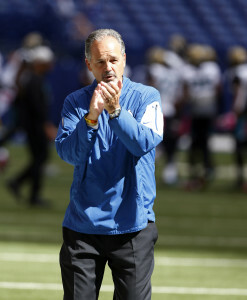 Pagano, 58, didn’t coach last season after being fired by Indianapolis, but he’s generated plenty of interest during the 2019 hiring cycle. He interviewed for both the Packers and Broncos head coaching positions, and has since been mentioned as candidate to take over as the Jets’ defensive coordinator under new head coach Adam Gase. Just today, Pagano interviewed for a defensive backs coach position with the Panthers. The Cardinals are looking for a veteran defensive coordinator to pair with rookie head coach Kliff Kingsbury, and Pagano — who’s been coaching the NFL for nearly two decades — would certainly fit that bill. He also runs a 3-4 defense, the same scheme which Arizona prefers to deploy. Thus far, the only other candidate that’s been linked to the Cardinals’ DC gig is longtime NFL coach Dom Capers. Like Arizona, Cleveland also hired a first-time head coach. Freddie Kitchens was a positional coach to open the 2018 season and had never ever served as a coordinator until midway through last year, so he could use an experienced defensive play-caller at his side. After installing Kitchens as their head coach, the Browns parted ways with former interim head coach/DC Gregg Williams and a number of defensive assistants. Cleveland is set to interview former Broncos’ head coach Vance Joseph for their defensive coordinator position on Friday. Former Browns interim head coach Gregg Williams is in consideration for the Jets’ defensive coordinator position under new head coach Adam Gase, Adam Schefter of ESPN.com tweets. The Jets’ list also includes Chuck Pagano, according to Jason La Canfora of CBSSports.com (on Twitter). The Browns went 5-3 under Williams in the second half of 2018, but the Browns gave most of the credit for that to offensive coordinator Freddie Kitchens, who was promoted to the role of head coach this week. After Kitchens was bumped up, the Browns and Williams parted ways. Williams was widely mocked for last year’s assertion that several teams wanted him as a head coach, but there’s no denying that he is a highly-respected defensive mind. The Jets have serious holes on defense – specifically, their pass rush – but there is an opportunity for Williams to thrive in New York with players like safety Jamal Adams and $100MM+ in expected cap room to address areas of need. Pagano’s name has surfaced again in the latest coaching cycle and he interviewed for the Packers’ and Broncos’ top jobs. At this stage, he’s realistically only in the running for lower staff positions. Aside from the Jets’ reported interest, the Panthers are set to meet with him to discuss their defensive backs coach position, according to Mike Florio of PFT.